A stylish invitation featuring gold foil on a thick kraft card. Invitations ~ Kraft & Foil Confetti are a stylish invitation featuring gold foil confetti and typography printed on a matt kraft card. Each invitation comes with a coordinating kraft brown envelope. They are perfect for a range of events and we love this as a ready-to-go wedding invitation option! Pack size: Available in a convenient pack size of 20 invitations or else select the “1 invitation” option so you can purchase exactly what you need. 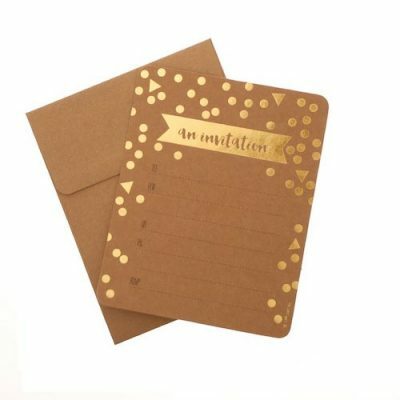 To add some extra pizazz to these invitations, you could include some gold confetti to the envelope.